The following allergens are currently in season. There’s no escaping dust mites – they’re a year-round problem all over the U.S. and the state of Texas. You’ll find them lurking in every corner of your house, behind the curtains, in your carpet, on your pets, and in your bed. Dust mite allergens are a common trigger of asthma symptoms and a major irritant for Texas allergy sufferers. Dust mites thrive in warm, humid environments such as bedding, upholstered furniture, and carpeting. Oak trees release their pollen in late winter and spring, blanketing our homes, vehicles, pets, and everything else in their path with a coating of yellow, dust-like particles and causing very serious reactions among allergy sufferers. People who are allergic to oak pollen may experience symptoms that include sneezing, runny or stuffy nose, itchy nose and throat, dark circles under the eyes, coughing, postnasal drip, and swollen, watery and itchy eyes. Mulberry reaches it's peak allergy season from Mid-February to Mid-April. It's a short season but these trees are known to be heavy pollenizers, making it a miserable allergy season for some. The type of trees that are the heavy pollinizers are the non-fruit producing trees. In an effort to control the mulberry population, many cities are banning the planting of new mulberry trees to cut down on overall misery. Ash trees can grow up to 90 feet tall and resist insects and disease. Unfortunately, ash trees are another troublesome source of irritation for Texas allergy sufferers in the early spring. Symptoms of an allergic reaction to ash pollen may include sneezing, nasal congestion, watery eyes, runny nose, itchy throat and eyes, and wheezing. Mountain cedar (or Ashe juniper) is one of the most potent allergens found in Texas. Pollen from mountain cedar is responsible for the mid-winter phenomenon known as cedar fever in central Texas. Pollen is released during December and January and can be carried by prevailing winds all over Texas and beyond. Symptoms include runny nose, a sore throat, and incessant sneezing. 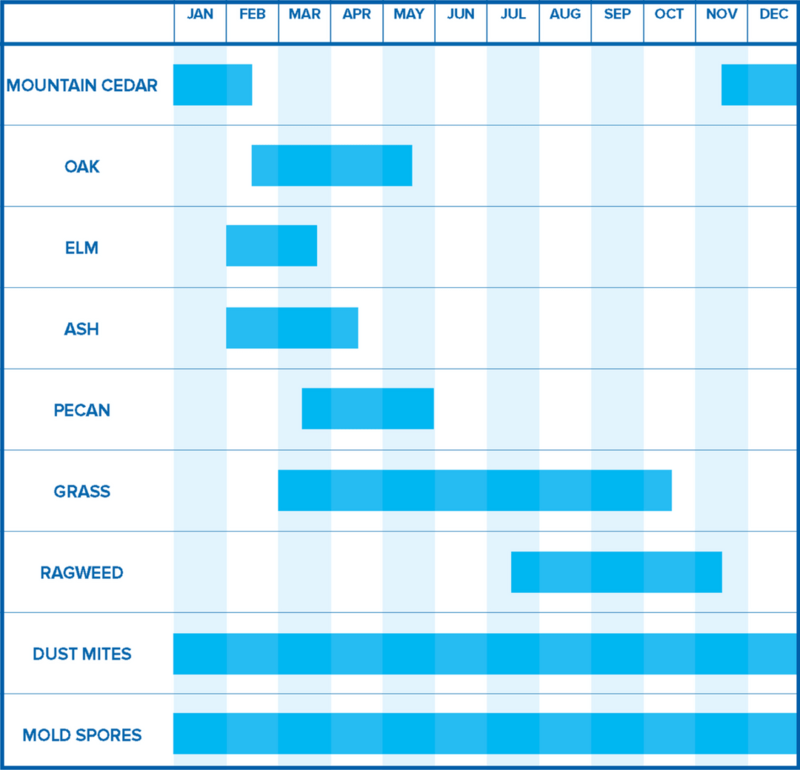 Here's when allergies are affecting us throughout the year. Get a printable version of our allergy calendar!